The term refers to a recent scandal where Volkswagen (VW), and other car manufacturers, falsified data reported to government agencies in order to hide the fact that their diesel vehicles were not in compliance with the law on air emission levels. The phrase is a play on the famous incident , the Watergate scandal, of a burglary in the 1970s at the Watergate apartment complex in Washington DC, which was part of an illegal surveillance and became a political cover up by the Nixon White House, leading to Nixon’s resignation as President. It was the subject of a famous movie, All the Presidents Men. VW manipulated testing systems on its “clean diesel” cars so that emission controls were activated only when the car was being subjected to any test of its emissions. At all other times the controls were off which provided greater acceleration and fuel efficiency, as well as more pollutants. 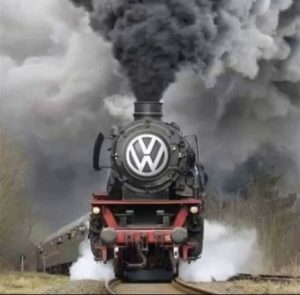 The fraud was discovered in the US where the Environmental Protection Agency and Department of Justice investigated and VW finally admitted to the dishonesty. Certain managers of VW in the US have been charge with crimes, VW is paying billions of dollars in fines and penalties, and VW is liable to car owners for any losses they incurred. In Europe, where diesel cars are much more popular than in the US, there has been little prosecution of VW and other manufacturers for this scandal. In fact, many governments provided monetary support for people to buy diesel cars on the belief that diesel cars emitted lower levels of carbon dioxide (CO2) than gas-powered cars. Has VW been fined or financially penalized by the EU or any Member State of the EU for its actions? If not, what explains the US aggressive enforcement and lack thereof in the EU? When and how were diesel cars promoted by the Irish and/or UK government? Are there still any subsidies for buying diesel cars? Identify the particular emissions from diesel cars that are subject to standards under EU law. Are there cities in Ireland or Northern Ireland where any of those standards are exceeded? If so, can we attribute the conditions, in any part, to diesel cars? Should the Irish and/or UK government now require that diesel vehicles be disfavored, and if so, how can they do that? Gwyn Topham, “Volkswagen scandal – seven days that rocked the German carmaker,” The Guardian (25 Sept 2015). Damian Carrington, “How conniving carmakers caused the diesel air pollution crisis,” The Guardian (7 April 2017).